Preheat the oven to 325 degrees F (165 degrees C). Line two large baking sheets with parchment or aluminum foil. 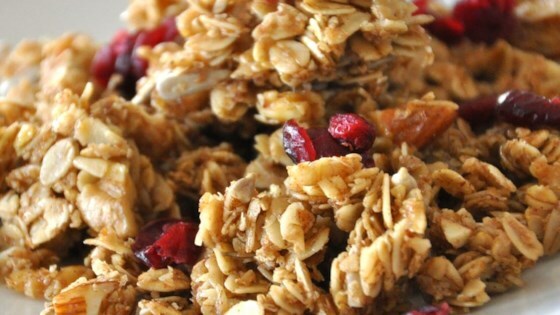 Combine the oats, wheat germ, oat bran, sunflower seeds, almonds, pecans, and walnuts in a large bowl. Stir together the salt, brown sugar, maple syrup, honey, oil, cinnamon, and vanilla in a saucepan. Bring to a boil over medium heat, then pour over the dry ingredients, and stir to coat. Spread the mixture out evenly on the baking sheets. Bake in the preheated oven until crispy and toasted, about 20 minutes. Stir once halfway through. Cool, then stir in the raisins or cranberries before storing in an airtight container. There is a slight mistake on the recipe. My original calls for 1 Tablespoon (not teaspoon) of cinnamon and 1 Tablespoon of vanilla.